"Is Joint Discomfort Keeping You From Doing The Things In Life You Really Want To?" I am so confident that I can help you reduce your joint discomfort that I’m willing to let you try my solution completely risk free for 60 days. No tricks, no gimmicks…just confidence. And if you stick with me for the next couple minutes, I’ll explain everything. That may sound funny, but it’s true. It’s about not being able to do the things you really want to without soreness and/or without paying such a huge price the next day that it’s no longer worth it. The fact is, there isn’t much we do without our joints. 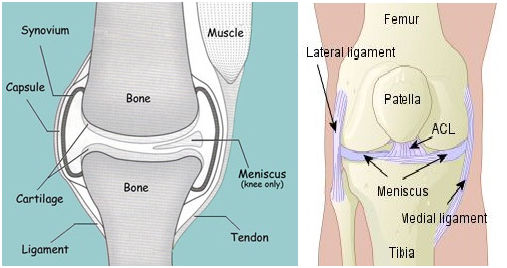 In order to understand the causes of joint discomfort, it helps to know what makes up a joint. Here’s the makeup of a Synovial joint at a very high level. Today, researchers believe there are supplements that can help improve each of the components of the joint, but almost none of common products available deliver a comprehensive solution based on the most cutting edge safe and natural ingredients available on the market today. In order to have a joint that functions properly without soreness, you need to ensure each component is healthy and strong. For example, you could have enough cartilage, but if you lack sufficient lubrication or have weak tendons, there can still be soreness. This is one reason why Glucosamine and Chondroitin are a good start, but not everybody sees progress when taking them alone. With this in mind, I asked the team at my lab to pour through all the latest studies and supplements on the market today so we could develop a comprehensive solution that would benefit the entire joint and really help people with their joint discomfort. The results were profound, and frankly, not what I expected. Glucosamine Sulfate HCL - “Glucosamine sulfate is a chemical found in the human body that is used to produce a variety of other chemicals that are involved in building tendons, ligaments, cartilage and the thick fluid that surrounds joints. Researchers believe that taking glucosamine supplements may either increase the cartilage and fluid surrounding joints or help prevent breakdown of these substances, or maybe both. Some researchers think the “sulfate” part of glucosamine sulfate is also important. Sulfate is needed by the body to produce cartilage. This is one reason why they believe that glucosamine sulfate might work better than other forms of glucosamine such as glucosamine hydrochloride or N-acetyl glucosamine” (Web MD). Chondroitin Sulfate - Commonly used in conjunction with glucosamine to help ease soreness, Chondroitin sulfate is considered to be a symptomatic slow-acting compound that has a slow onset of action that improves osteoarthritis symptoms after a couple of weeks. It is believed to produces a slow but gradual decrease of the clinical symptoms of osteoarthritis and these benefits should last for a long period after the end of treatment. Significant data suggests that Chondroitin sulfate could have a chondroprotective action by modifying the structure of cartilage. Shark Cartilage - Is believed to combat both the causes and symptoms of arthritis by repairing damaged cartilage, reducing joint swelling and soreness and lubricating joint surfaces; which increases joint comfort, flexibility and mobility. Cetyl Myristoleate - Cetyl myristoleate is taken to help lubricate joints and muscles, reduce soreness, boost the immune system and help fight infections. With that in mind, the most common use for cetyl myristoleate is to relieve the soreness and soreness associated with osteoarthritis. Methylsulfonylmethane (MSM) - MSM is found in small amounts in everyone’s blood, and it is a necessary building block for proteins; especially those found in the hair, muscles, and connective tissue of the joints and skin. Studies have shown that the combination of MSM and glucosamine benefit in the treatment of arthritis. Boswellia serrata extract - Boswellia is an herb that is believed to be effective in promoting joint health. It is believed to increase absorption and bioavailability (thereby making any other supplement ingredient dosages more effective). Boron- an important trace mineral that is believed to be effective in the relief of joint discomfort. In particular, it aids calcium integration into the cartilage and bone, and this can reduce soreness because bones are stronger and there is additional cartilage to cushion the joints. Piperine - Is the active phenolic component in black pepper extract, and it is believed to reduce soreness in those who suffer from rheumatoid arthritis and osteoarthritis. Similar to Boron, it is also believed to promote bio-availability of other nutrients which means more of the ingredients taken in combination with Piperine will be absorbed. Vitamin C - Is familiar to most of us, but its role in joint health tends to be underappreciated. Vitamin C not only helps produce collagen, a major component of joints, but sweeps the body of destructive molecular byproducts known as free radicals, which are destructive to joints. Without vitamin C and other antioxidant nutrients, free-radical damage to joints would be much worse. One of the best-known studies looking into vitamin C and arthritis, the Framingham osteoarthritis study, found that people whose diets routinely included high amounts of vitamin C had significantly less risk of their arthritis progressing. Manganese - a trace mineral is found in small quantities in the bones, kidneys, liver and pancreas that is known to be an anti-oxidant that fights free radicals that attack body cells. In particular, the antioxidant superoxide dismutase (SOD) is low in people who suffer from arthritis. SOD prevents soreness of joints, and according to clinical studies of those with osteoarthritis and rheumatoid arthritis, a combination of Glucosamine, Chondroitin and Manganese can alleviate soreness. Copper - Similar to Zinc, Copper needs to be sourced from external sources and it is an effective soreness reducer. In addition, it is also aids in growth of connective tissues and wound healing. Chromium - is an essential trace element and over 90% of U.S. adults have a deficiency of the mineral chromium because it is not readily absorbed from foods. Chromium is believed to help control glucose and insulin levels which means it can help control weight and blood sugar levels. There you have it! Based on our research, these are the most effective ingredients available for joints. we knew we had a formula for a product that could really help people. 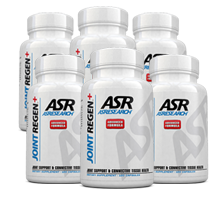 Joint Regen – The Most Complete Joint Formula Available! Yep, it’s no coincidence that it has every joint benefitting ingredient discovered in our research…in one product! As you can imagine, to purchase each of these separately would be pretty expensive and ALOT of pills. 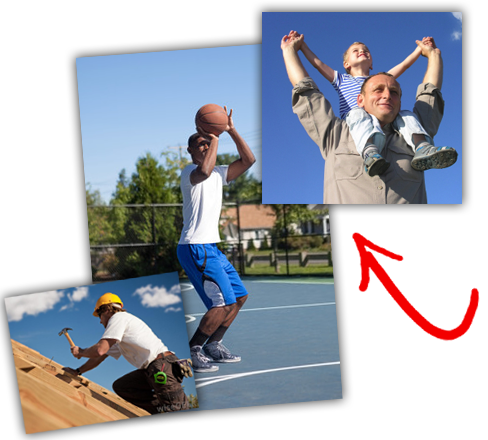 But my goal isn’t to gouge you for $164.41…it’s to get the best joint solution in your hands so you can start doing the things you really want to do again. 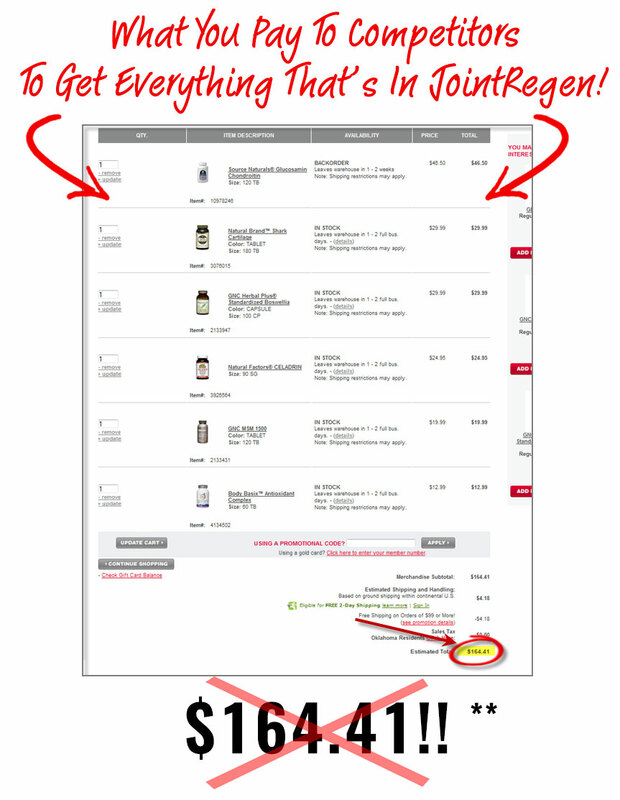 Almost all of us have dropped our hard earned money on a supplement that hasn’t delivered. And with that in mind, I’m willing to assume 100% of the risk to let you figure it out. That’s right – I will send you a bottle of Joint Regen, let you try every capsule, and if within 60 days for ANY reason whatsoever you’re not satisfied, I will refund the ENTIRE purchase price. I firmly believe you shouldn’t be on the hook to pay for a product that doesn’t perform consistent with what I claim it will. That’s my pledge to you and why I’m willing to take all the risk. 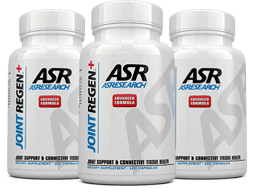 After investing significant time and money into researching and generating the precise formula you see above, my management team wasn’t too excited about me offering Joint Regen for only $39.95. I won them over by promising that this would only be the introductory price. So if you are currently suffering from joint discomfort and want to get back to the things you really want to be doing, the time to act is now. 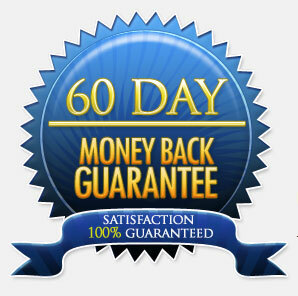 Again, I am so confident that I am willing to put my personal 100% satisfaction guarantee on the results. This is not a gimmick. My staff and I are highly accessible via your preferred communication method and we aim to ensure you are satisfied…no matter what. Now is the time start making progress towards getting back to what you really want to be doing…without joint discomfort! Go ahead and choose how many months’ supply you want above, and we’ll get your Joint Regen shipped out right away! Best of luck to you and I look forward to hearing about your results with Joint Regen! PS: If joint discomfort is keeping you from doing the things you want to do, the time to act is now because I am personally giving you 60 days to try Joint Regen with absolutely zero risk. Yep, you can take every pill and if you’re not satisfied I will refund the entire purchase price. PPS: If you have been taking an incomplete solution featuring 1 or 2 of the ingredients we discussed, you owe it to yourself to try a comprehensive solution while there is zero risk to do so. 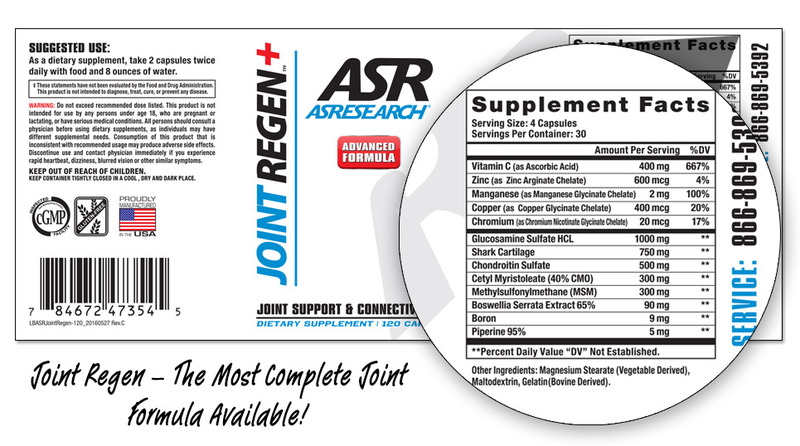 PPPS: Remember, not only do the ingredients in Joint Regen offer a comprehensive solution, they have been shown to work synergistically…in other words, they offer the greatest benefit to your joints when taken together…something you can’t get elsewhere from single product! Statements on this website have not been evaluated by the Food and Drug Administration. Products are not intended to diagnose, treat, cure or prevent any disease. If you are pregnant, nursing, taking medication, or have a medical condition, consult your physician before using our products. The website's content and the product for sale is based upon the author's opinion and is provided solely on an "AS IS" and "AS AVAILABLE" basis. 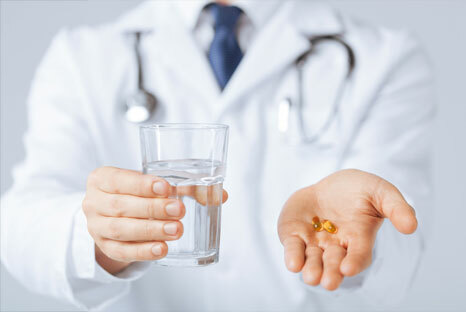 You should do your own research and confirm the information with other sources when searching for information regarding health issues and always review the information carefully with your professional health care provider before using any of the protocols presented on this website and/or in the product sold here. Neither ClickBank nor the author are engaged in rendering medical or similar professional services or advice via this website or in the product, and the information provided is not intended to replace medical advice offered by a physician or other licensed healthcare provider. You should not construe ClickBank's sale of this product as an endorsement by ClickBank of the views expressed herein, or any warranty or guarantee of any strategy, recommendation, treatment, action, or application of advice made by the author of the product.